According to my friends who are more familiar with Astrology than I am, Pisces have highly addictive and suggestible personalities. I am inclined to agree with that...although, I am the highly suggestible type, so is that really any big surprise? You know those impulse items they put right by the check-out registers at stores? Those items that normal people look at and say, "Who the hell needs one of those?" Allow me to answer that for you: Me. I need those. 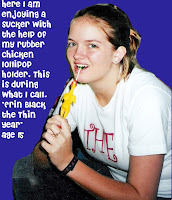 I need that rubber chicken lollipop holder. And no, I did not just make that item up. I own such an item...actually, I own more than one (they were available in both yellow and white). Luckily for me, this suggestive spending has yet to transfer over to expensive items. I just did a brief search for my rubber chicken lollipop holder(s) and was not successful...I anticipate tearing my room up later, in hopes of finding them. During my research of my zodiac sign, I learned that I am ill-advised to try drinking, drugs and gambling. Oops. Speaking of gambling...I just watched the movie 21 and now I really want to go to Vegas and play black jack. I'd also like to successfully count cards. Other than my bad math skills and non-existent poker face, I could totally do it. Lately I've been trying to figure out what to do with my life and, as usual, I am being influenced by everything around me. Unfortunately for me, I'm not observing anything realistic...for example, I'm almost certain it is too late for me to start my Olympic career. And even if it wasn't, I wouldn't succeed because it really creeps me out when women get super muscley. Don't get me wrong, I'd give anything to be thinner, (I'd shave my head if someone told me I'd lose weight--and keep it off) but I would never want to look like those body builder women. I'd much rather be pleasantly plump. There is nothing pleasant about creepy muscle ladies. (I was going to put a picture of 1 of them in here...but it's too gross). The other obstacle in my Olympic career is the new scoring system--I just don't get it! Another recent interest of mine is the Twilight book series. It's a 4 part love story about a girl and a vampire. I'm not going to lie to you, the entire reason I decided to read the book was its popularity in Facebook flair. If reading a book based on faux buttons on a networking website isn't suggestible, I don't know what is. I would totally date this fictional vampire. The main flaw with this plan is the fact that vampires aren't real. Even if they were real, I don't think they'd live in the south...too sunny. Perhaps if I watch enough TV and movies and read enough books, I'll eventually stumble across something that not only sparks my interest but something that I'm actually able to do. The other day I found myself thinking about the 1993 film Free Willy. Because that's the kind of time I have on my hands; time to think about movies I haven't seen since my age reached the double digits. Allow me to enchant you with the film's tagline, "A 12 year old street kid. A 3 ton orca whale. A friendship you could never imagine. An adventure you'll never forget." The thought that occurred to me during this trip down Memory Lane was [spoiler alert] that although Willy was freed at the end, there is no way he could've survived in the wild. He'd been domesticated far too long; recall how his fin was all weird and curvy due to his confinement? And I'm pretty sure that his zoo tricks would get him a lot of street cred in the wild. Granted, in 1995 Free Willy 2 came out, confirming our hopes that Willy had survived. But I don't really remember that one...maybe I didn't see it. I just investigated the plot summary on (one of my favorite sites) and I definitely did not see Free Willy 2. Apparently there is also a Free Willy 3, I did not know that. I can highly recommend the original Free Willy, but cannot vouch for the rest of the trilogy. But if I run out of items on my Netflix Queue, I'll be sure to add the rest of Willy's adventures. IMDB has also just taught me that at the end of Free Willy, there was an 800number for Saves the Whales and over $20 million was donated by viewers. Also, the role of Willy was played by Keiko...Keiko receives higher billing than any other cast member of this film. When I was younger, I wanted to be an actress; but not an actress billed after a whale. As usual, it has taken me several "set-up" paragraphs before reaching my initial point. I realized that many of the movies we watched as children did little more than confuse us. We all thought Willy would go on to thrive in the wild, perhaps settle down with a little whale family and maybe naming his whale son Jesse, after the boy who helped free him. But that wouldn't happen in the real world. Not to mention the fact that the entire movie is a sort of protest against our imprisoning wild animals for our own amusement and yet, the star (with top billing) of the film is nothing more than an animal trained to perform for our entertainment. That is way more ironic than anything Alanis Morisette ever sang about (I love that song, by the way). I do realize that movies aren't necessarily meant to be realistic. The beauty of television and movies is that they provide an escape from reality. Most of the concepts instilled in me by movies of my childhood have long since been disproved; others (such as this one) have taken a little longer (say 15 years). This is far from my last post on movies. Not only do I love movies, but I just stumbled upon a list of guilty pleasure movies which I may have to review and insert my own delightful opinions. I saw this commercial for the first time a few days ago and it really cracked me up! Rider Strong wrote it for a contest http://www.moveon.org/ was having. He directed it with his brother and his girlfriend. The contest was to create a 30 second ad for Obama's campaign. I love how grassroots Obama's campaign is!